When I began lettering comics in 1977, nearly every interior page was lettered on pencilled original art. Cover lettering was done on separate paper, then photostatted and pasted on the cover art along with all the other trade dress. 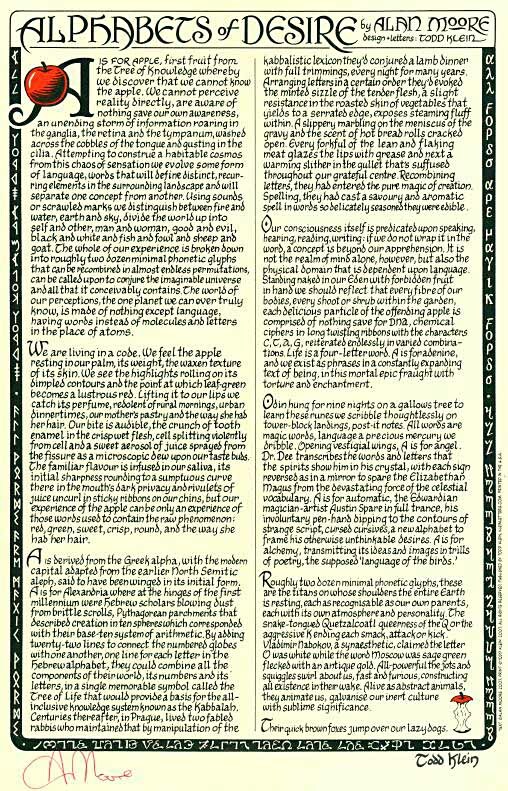 Some time in the 1980s, art began to be lettered on vellum overlays at least some of the time. There were two main reasons for this. One, if it was painted art, there was no other option. 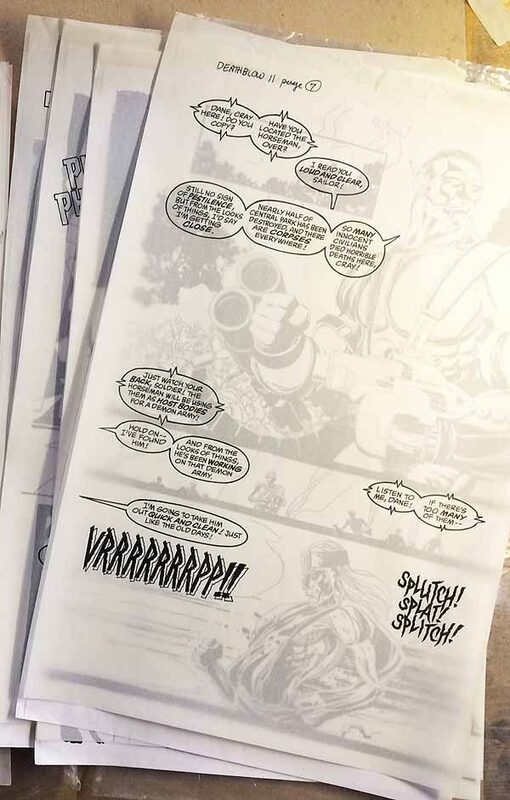 Two, if the artist was running late (very common), the lettering could be done on vellum laid over photocopies of the pencilled art, allowing the lettering and the inking to be done at the same time. When the DC Production department had the finished art and the lettering overlays, they would photostat the lettering and paste it onto the art. This became more and more common as time went on. Originally a premium was paid for lettering on overlays, possibly as a way to discourage editors from doing it by adding extra cost to their budget, but that went by the wayside over time. By the early 1990s I would say at least half of my lettering was on overlays. In the early years of overlay lettering, when asked if I wanted my lettering vellums back, I would say, “No, just throw them away.” Some time around 1993 I decided to start accepting them back as art returns with the idea that I could sell them at conventions or by mail. Over the next ten years or so I accumulated several thousand pages of these lettering overlays, and did sell some from time to time, though they were never in any kind of demand. When the switch came to digital lettering, of course, hand-lettering on either original art or overlays declined, and I think the last ones I received were from around 2003. And I never made a point of asking for them, but if someone decided to return them to me, I’d take them. When I launched my website in 2007, one of the categories on my BUY STUFF page was vellum overlays, in lots of 5 or 10 pages. Originally there were about a dozen titles offered, plus grab-bags of miscellaneous items. They sold steadily. As of yesterday I was down to two titles. Today I received a large order for these overlays that essentially wipes out my remaining stock. A few examples from DEATHBLOW #11 (cover dated Dec. 1994) are above. They’ll go out to the buyer Monday, and vellum overlays will no longer be offered on my website. End of an era! This entry was posted in Items for Sale, Lettering/Fonts on December 3, 2016 by Todd. Thanks, J M, you made my day! This entry was posted in Items for Sale, Lettering/Fonts on May 20, 2016 by Todd. 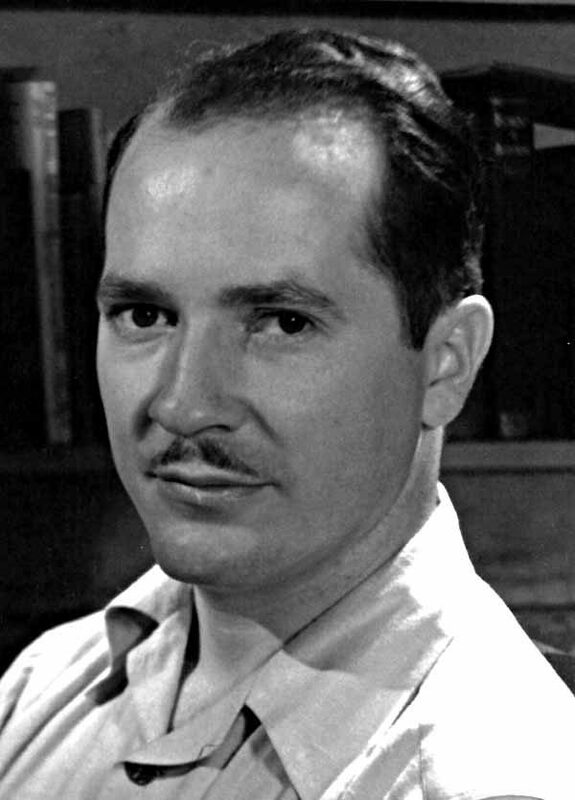 Robert A. Heinlein, early 1940s, image found online. This entry was posted in Items for Sale on April 17, 2016 by Todd. The first signed print I did was with Alan Moore, “Alphabets of Desire.” I had no idea how well it would sell. I priced it at $16, and the initial 500 copy print run sold out in about a week. I did a second printing of 500 that sold more slowly, but eventually that went, too. In the fall of 2008 I did a third printing of 500 copies, and that has sold gradually since, I’m down to about 150. Each printing was signed in different colored ink by Alan, and the second and third printings also say that in the small type on the lower right edge. As with all my prints, I made a few extra copies for myself, and I have one of my own first printing copies on eBay this week. The link is HERE. The last one I sold went for lots more than the starting price. 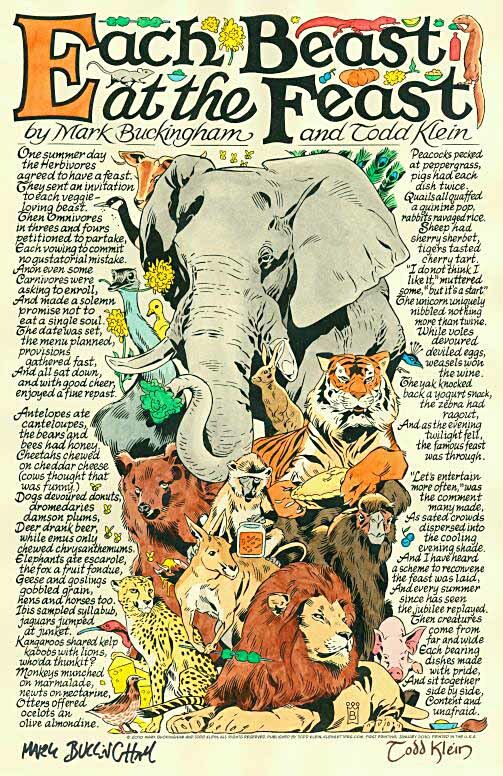 My fifth print in the alphabetical series was “Each Beast At The Feast” in 2010, written by me with wonderful animal art by Mark Buckingham. The print run was 500 copies on pale orange paper, and Mark signed them in orange marker. That version is HERE. I thought it would be cool to do a much shorter edition on paler paper which I could paint with watercolors when I had time. I made 50 of those, as seen above. Mark signed them in black marker and I signed in brown. Painting them was fun, but took lots of time. An article about the process is HERE. In the winter of 2010-2011 I painted 20 copies. I priced them at $50 each plus shipping, and they sold pretty quickly. Earlier this year I painted 10 more copies. I offered them first to my mailing list, and sold six that way. I’ve put one of the remaining four on ebay HERE. The starting price is $29.99. No one has bid on it yet, but I don’t expect that will last too long. Hope you’ll have a look. There’s one other print on eBay this week that’s not so rare, and not published by me, but I did the lettering and design. It’s “In Reilig Oran” by Neil Gaiman and Michael Zulli, printed in full color by Neverwear (Cat Mihos) in 2011. That auction is HERE. Sorry for the commercial, back to regular blogging soon. This entry was posted in Items for Sale on April 4, 2016 by Todd. This a bit off my usual topics, but I’m currently auctioning these two beautiful Japanese woodblock prints on eBay for my mom. Paul Jacoulet was born in Paris either in 1896 or 1902 (sources vary). He moved to Japan with his parents at age 4, his father was a teacher at the Tokyo University. Young Paul was often in poor health, but developed skills in drawing, music and languages, he spoke Japanese, French and English fluently. He began painting at age 11. Jacoulet took many subjects for his prints from trips to the South Sea, Korea and Manchuria beginning in 1929, making sketches and taking photographs. 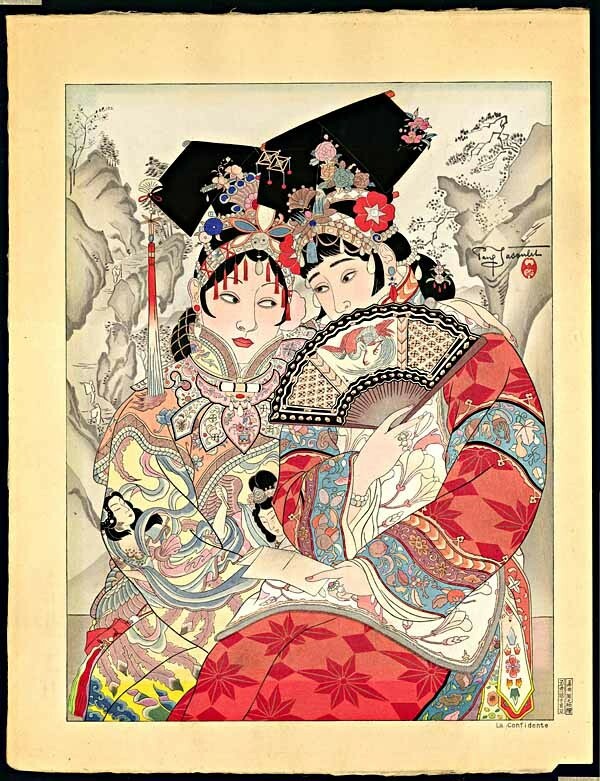 He created his first woodblock print in 1934, working with professional Japanese carvers and printers. His technical requirements were very high, and he would only work with the best. Jacoulet published most of his prints himself, sold in a subscription scheme, so the amount of copies of each print was small. For his prints he used special watermarked papers from Kyoto. He used very elaborate techniques, including embossing, lacquers, micas, metal pigments, and experimented with new techniques like powdered semi-precious gems. For some prints he said he used as many as 300 color blocks, but Jacoulet had a reputation for exaggeration. One of his assistants later remembered they used up to 60 blocks, still a lot. One site says he made a total of 166 designs, another lists 178, so there’s some dispute on that. After the war his work became famous worldwide. Among his admirers was American General Douglas MacArthur, in charge of the U.S. occupation of Japan. 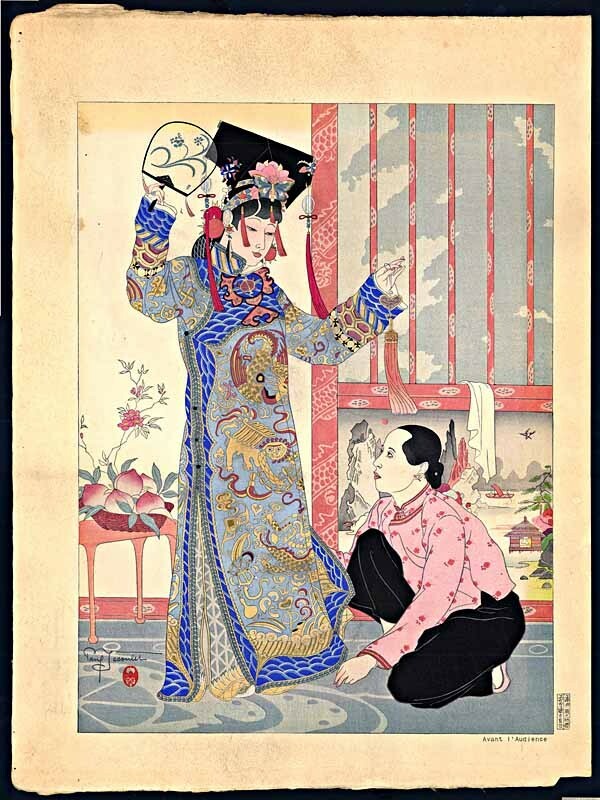 Jacoulet continued to produce prints in Japan until his death in 1960. My mom received them from her Aunt Olive Baker about ten years ago. The prints were given to Olive and Leland Baker by Mrs. Pat (Nancy) Echols in 1976. Colonel Marion Patton Echols and his wife Nancy were stationed in Japan during the occupation of Japan following World War Two. Colonel Echols was General MacArthur’s public relations officer at that time. (A memorial biography of Colonel Echols can be found on the West Point Academy website.) Aunt Olive told my mother that Nancy Echols tutored the children of Emperor Hirohito and was given these prints as a gift from the emperor’s family. We have no documents to corroborate that. 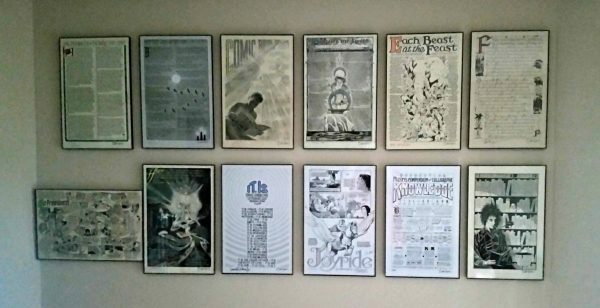 I believe the prints were unframed when given to the Bakers, as they had them framed in Virginia in 1979. If you’re interested in having a look at the auctions, where much larger images can be seen, the links are below. I enjoyed researching these beautiful works of art. This entry was posted in Items for Sale on January 5, 2016 by Todd.